Saturday 10th November is World Science Day. But every day is science day in our house. Whether we’re working out how much baking powder will make the cake rise, to calculating our speed at running up the steep inclines near the house, to gathering different types of fallen leaves outside the front door. Because, for children, science doesn’t necessarily slot neatly into a named discipline, but fits into everything they do, everywhere they go. In the same way that these books aren’t chemistry or physics text books, but a wonderful mix of non-fiction picture books, non-fiction narrative, fiction etc; and they introduce science into children’s lives in a range of different ways. This bouncy fiction title from best-selling American author James Patterson is a typical adventure story, but it oozes science and is all the more winning for doing so. Twelve-year-old orphan Max lives above stables in New York City, and is obsessed with Albert Einstein. She’s a bit of a genius herself, fabricating records to get a place at NYU. Then one day, she’s recruited by a mysterious organisation, taken to a gathering of the world’s other child prodigies in Israel, and asked to take part in a competition to lead world-saving projects. With teamwork and creativity, Max overcomes various obstacles, and nasty ‘oligarch’ baddies to win the day, providing globally conscious, humanitarian solutions to various scientific problems. 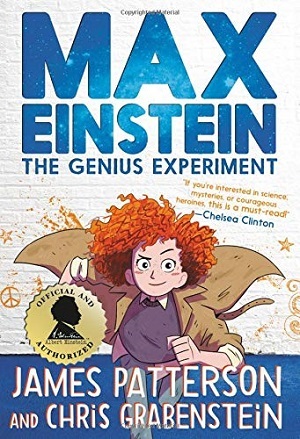 The setting of part of the book in Israel is down to the fact that the book is officially approved by the Albert Einstein Archives (housed at Hebrew U in Jerusalem) and so Patterson liberally sprays his text with Einstein quotes (they all work within the plot and are great fun), as well as simply explaining with a deft writer’s touch ideas such as The Theory of Relativity. These science bits are sprinkled throughout and are lovely touches – buried within the story so as not to feel too sciencey, whilst also clearly imparting knowledge. Holding many of the ingredients for a key ‘girls in STEM’ title, such as learning about teamwork, caring for the planet, new technology, resilience, kindness to others, and the pursuit of creativity as well as knowledge in problem-solving, this is an excellent story with a warm protagonist who should win hearts everywhere. Includes glorious science-themed black and white illustrations. Find your inner genius here. 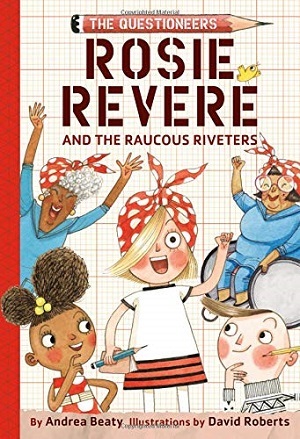 I turn to the Rosie Revere picture books time and again for all sorts of purposes – the rhyming, the illustrations, the scientific message, feminism, the humour, characters, and so much more. Now, engineer Rosie has her own chapter book starring her friends architect Iggy Peck and scientist Ada Twist. In this first of a series, Rosie’s Great-great Aunt Rose introduces the children to the Blue River Riveters, a group of women who built aeroplanes during WW2. One of them, June, wants to enter an art contest but has broken both her wrists in a motor-scooter accident, so needs Rosie to invent something to help her be able to participate. The book is smart and fun, despite losing the rhyme, and continues the theme of girls in science as Rosie confronts the historical lack of women in traditional science jobs, as well as providing new themes of cross-generational bonding. As always with Rosie, there is learning from failure and experimentation and developing her persistence and resilience, and also a nod to science with the graph paper backgrounds and illustrated inventions. With its short chapters and two-tone illustrations, this is a good follow-on to younger fiction for those who have read the picture books so many times that they need something new. I can see Rosie going from strength to strength – just like her inventions. Ask your questions here. I really approve of a comedian writing science books for children. Although I generally dislike promoting celebrity books, this hits a good note with me. It isn’t meant to be high-level science, and is delivered as a narrative strand – much like a comedian delivering a standup routine. And yes, amongst the sciencey bits are plenty of fart jokes, and the text is punctuated (probably almost more than necessary) with a huge number of WORDS IN CAPITALS, different typefaces, and many cartoons. 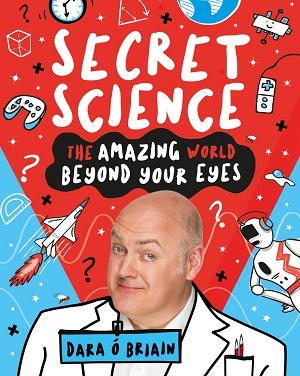 This book covers the science that you can’t see – hormones, forces, energy etc, aiming to answer questions that children will spontaneously ask – why does hair stand on end, how do giraffes sleep? There are some lovely descriptions, including how a jet engine works and comparing it to a hose pipe, as well as parts that describe what stress does to the body and how to relieve it. Luckily, there’s a cool index at the end so that you can dip in rather than read the text all the way through, as it can be quite a noisy book. There are also the now necessary warnings about climate change and the environment. An entertainingly busy read. Discover the secrets here. Before we tackle the large non-fiction, I must also draw your attention to a new periodical. 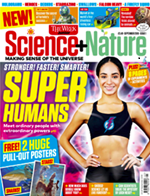 The Week Junior has long been a favourite of mine for its bright photographs, news round up and excellent cultural coverage, but now there’s a The Week Junior Science and Nature magazine. This monthly 60 page magazine holds multiple entry points – a reader can dip and discover, absorbing fun facts or reading a feature. The first issue was in September, and featured such current topics as the secret behind Fortnite’s success, but also an in-depth feature on superhumans. Each month will have an eight-page Lab section with experiments and a monthly guide to the night sky for budding astronomers. Really excellent quality. You can order it here. 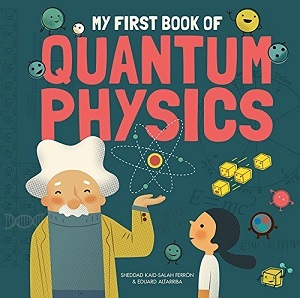 Subtitled ‘A Visual Exploration of Physics, Sound, Light and Space’, this is an elegant title with simple text and sharp colourful graphics that uncovers the mystery behind basic quantum physics. It goes beyond starlight to investigate the science behind space but also how we explore the Universe. 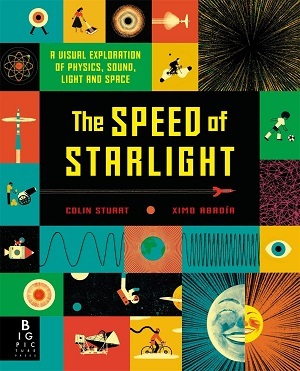 Divided into the four sections named in the subtitle, the book explains, using simple graphics, Newton’s Laws of Motion, the insides of an atom, soundwaves, photosynthesis, the colour spectrum and then goes into space. Any author who’s had an asteroid named after him in recognition of his work to popularise astronomy must know a bit about what he’s writing. Not only does Colin Stuart have the expertise and enthusiasm, but he can explain it in the simplest terms without resorting to cliché. Find your speed here. From physics to chemistry in this illustrated guide to the chemical elements. 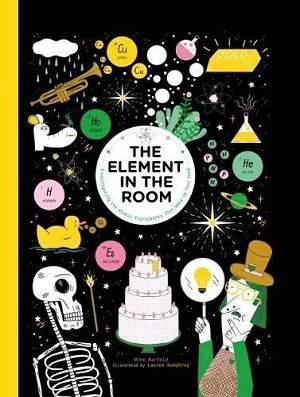 Any book on chemical elements will feature the periodic table, plus a small handy guide to each element, detailing its name, symbol, atomic number, key characteristics and so on. But here, as well as this basic information, the book is set out as a sleuth story, solving the case of the element in the room with a detective (Sherlock Ohms) whose catchphrase is ‘Elementary’ of course. To add spice and fun to the mix, the text is interspersed with full page comic strips, the first of which, for example, is a fun guide to Aristotle’s belief in the four elements – earth, air, fire and water. There’s so much information packed into this book it would feel bamboozling if it weren’t for the sheer creativity of the author and illustrator, who explore where in the house the element can be found, (sodium in urine, zinc in nappy cream etc), fun experiments (building an electric lemon), and clever explanations of basic chemistry. You can buy it here. The very friendly illustrations, and quite large font size in this book belies the difficultly level of the subject matter and text in this absorbing yet challenging physics book. This book goes in a slightly different direction to the two above, exploring theoretical physics as much as the practical stuff. So, you’ll find pages on Schrodinger’s Cat as well as a page exploring waves and particles. This is an exciting book in that it leads to further thought and investigation rather than just imparting knowledge. There are good colourful graphics that attempt to illuminate the harder principles, such as The Uncertainty Principle or the Mystery of Antimatter, and illustrations that will explode the mind, such as the Tunnel Effect. I liked the graphic representation of the periodic table here – building blocks fitting together like Lego, and CERN represented as a toy train track. Amusing, stimulating and challenging – an awesome if ambitious science book. Explore theorem here. When I talk to parents whose children aren’t keen readers, I often mention how important it is to find another way into books – to make reading a habit. One brilliant stepping stone to engage children who aren’t ready for a lengthy book is to turn to a periodical. These are still relevant for keen book readers – many of the keenest readers adore my first featured periodical for its ability to tell a story and wait breathlessly for their Friday installment. The three periodicals featured below are informative, engaging, interactive, and interesting, and also work as an extra treat for the most dedicated book readers. 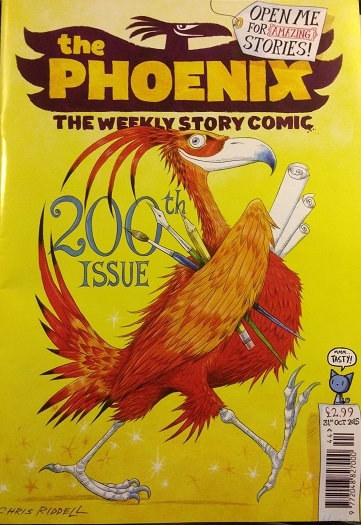 I’m starting with The Phoenix because it celebrated its 200th edition last Friday. The Phoenix is a weekly comic for children aged about 6-12 years. Rather than just containing comic strips, it also features adventure stories – serialised week on week. In fact you may have seen some of these produced as books, including Corpse Talk by Adam Murphy. This comic strip appears in The Phoenix each week and brings back from the dead a famous character from history, supplying excellent non-fiction snippets, and cringe-worthy jokes (the book was shortlisted for the 2015 Blue Peter Best Book of Facts Award). Evil Emperor Penguin by Laura Ellen Anderson (a prolific children’s book illustrator) also features weekly, and Anderson’s Penguin adventures were also published as a book this October. As well as the captivating story-telling in the comics, and the humour, and the facts contained within Corpse Talk, parents love that there are no gimmicks – no adverts, no plastic toys. The 200th edition has a beautifully illustrated cover by our children’s laureate, Chris Riddell, and a preview for the new strip called John Blake coming 2016 written by Philip Pullman, and illustrated by Fred Fordham. This edition also sees The Phoenix being stocked in WHSmith for the first time. 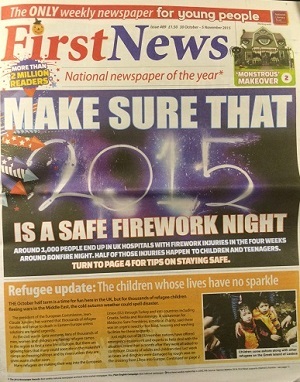 Another weekly that is fought over by children each week (“I’m reading it first!”) is First News. A weekly national newspaper for children, it features news told in a non-patronising but accessible way. Each news story assumes little prior knowledge on the history of the topic, so gives the story context, and tries to present it in an appealing way with graphics where necessary. There is general news, home news in snippets encircling a map of Great Britain, world news presented likewise, but with reference numbers for each piece of text corresponding to the appropriate place on the world map (geography has never been so interesting), picture news, science, animals, entertainment and sports news. There are also weekly features including a comic strip, jokes, amazing facts, interviews, book reviews and a book corner, puzzles, and a great section called ‘Your News’ in which children send in their own reports about interesting experiences they have had. It sounds comprehensive – and it is. It manages to tackle sensitive issues, such as refugees, bullying and the environment well, without resorting to sensationalism or being too simplistic. The special editions, which are printed as an in-depth look at certain subjects, are also well presented. The Election 2015 edition was particularly well done. The weekly newspaper does contain adverts, but having seen almost 100 editions, I’ve yet to find anything too objectionable. It’s an excellent source for knowledge about current affairs for children. A print version of the wonderful Newsround from the 1980s. The ultimate magazine for young non-fiction fans, Aquila is a monthly issue rather than weekly. Aimed at roughly 8 years and over, it features one topic per month and delves into it in a range of fun, interactive and informative ways. Next month is Life on Mars, this month was Invisibility. The team behind the magazine deal with each subject in an imaginative way. 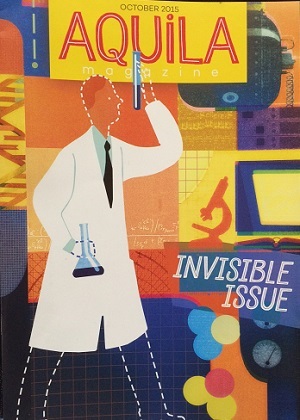 Invisiblity is addressed not only as when you might feel invisible (such as starting a new school) but also what’s invisible in the natural world – because it is camouflaged. The Invisibility edition features an activity to help the reader make an invisibility cloak, a science experiment to make an object invisible, information on static electricity – which of course you can feel but not necessarily see, a double page spread on archaeologists ‘seeing’ what’s invisiible, and the history of priest holes, which are ancient hiding places – the sort that some Catholic priests used for hiding places to escape capture following the Gunpowder Plot. There are also stories, puzzles and competitions. As with The Phoenix, there are no adverts, just a very full letters page with enthusiastic feedback from readers. It’s for curious children everywhere, and is delivered by post.